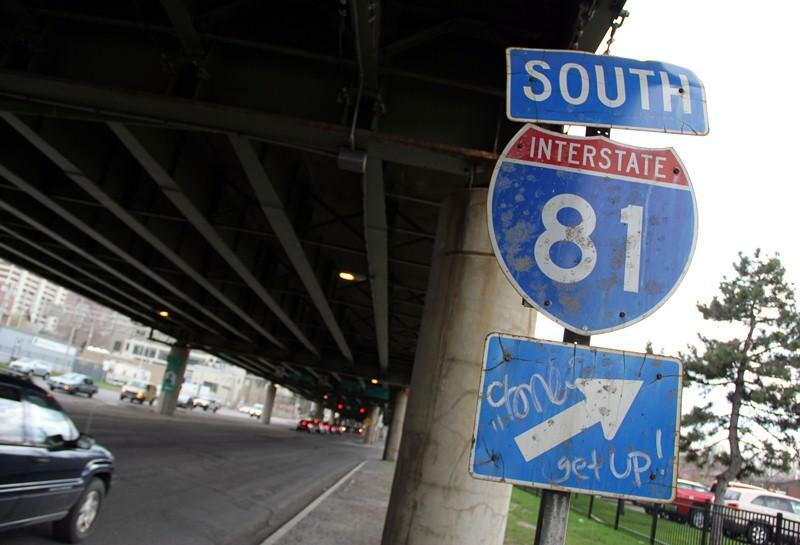 A sign for Interstate 81 sits under an overpass in Syracuse, N.Y. City officials and residents are debating what to do about an aging stretch of the highway that cuts through the city. Hazel Miller's home is located about 100 feet from I-81. She moved into the Pioneer Homes, a low-rise public housing project, 40 years ago, when houses were still being ripped down to make room for the highway. Bill Egloff, I-81 project manager for the New York State Department of Transportation, and Meghan Vitale of the Syracuse Metropolitan Transportation Council stand underneath the I-81 viaduct in Syracuse, N.Y.
Now, the region is starting to think about what Syracuse might look like without the viaduct, which both speeds traffic through the city and divides the community along economic and racial lines. 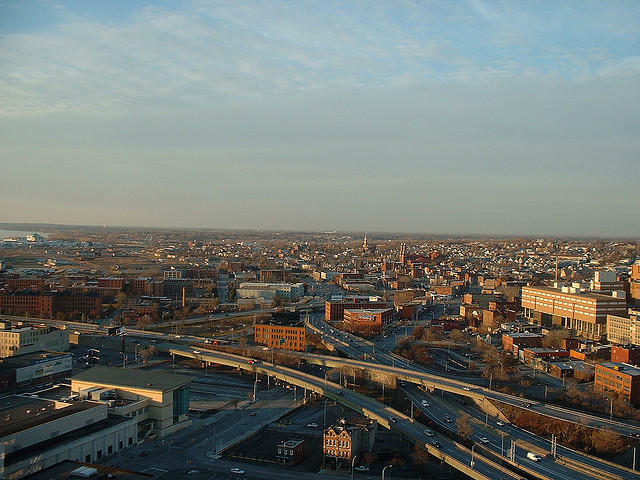 If the viaduct is torn down, Syracuse would join San Francisco and Milwaukee, where the removal of urban highways over the past two decades has spurred development. Still, it's early in the process. Hazel Miller lives about 100 feet from I-81 in Pioneer Homes, a low-rise public housing project in Syracuse. She moved there 40 years ago, when homes were still being ripped down to make room for the elevated highway. I-81 in Syracuse was built right through the middle of one of New York state's first public housing projects, gutting this predominantly African-American neighborhood. As long as Miller has lived there, the highway has driven away commerce. "We don't even have a grocery store close," she says. Syracuse Common Council President Van Robinson says replacing the viaduct with a street-level boulevard would breathe life into the city's withered urban core. He has long seen the viaduct as a barrier that separates the haves from the have-nots. "It's not a question of if it should be torn down. The question is when will it be torn down," he says. Robinson, who founded the local chapter of the NAACP, has wanted to remove I-81 since he first arrived in Syracuse decades ago. "It was a city divided," he says. "In fact, I immediately, at that time ... called it the 'Berlin Wall.' "
On one side of that wall is prosperous University Hill, home to the institutions that drive Syracuse's local economy. On the other side is poverty and neglect. A few years ago, some streets within the Pioneer Homes were gated off in response to a rash of drive-by shootings. Robinson says tearing down I-81 is a relatively simple step that could help turn the neighborhood around. "It's not as if it's a hundred miles of roadbed we have to put down. It's 1.4 miles," he says. A few years ago, Emanuel Carter, a professor at the State University of New York's College of Environmental Science and Forestry, teamed up with a local citizens league on a study called "Rethinking I-81." The main finding was that removing the I-81 viaduct would spur significant development. "We're in full-blown sprawl mode right now," Carter says. "And one of the ways we can kind of refocus on the core would be to have [I-81] cease to be an impediment." Bill Egloff, the project manager for the New York State Department of Transportation who is in charge of keeping I-81 standing, admits that something needs to be done about the highway. It plays a vital role in making Syracuse what planning officials call a "20-minute city," where you can drive anywhere you need to quickly and easily. But Egloff says tearing it down is no simple fix. "If the remaining traffic had to negotiate the city streets as they are right now, that would be a problem," he says. The state's transportation department is in the early stages of a planning process called the I-81 Challenge. Planners recently gauged public opinion on three basic options: keep the viaduct and update it to current standards; tear it down and build a sunken roadway; or tear it down and build a boulevard. Egloff says none of the options will be cheap. "Five years ago, we had our structures engineer give us a rough estimate of the whole deck replacement and that was in the neighborhood of $350 million," says Egloff. Planning officials now say that "cheap" option would be at least a half a billion dollars. Traditionally, nearly all of that price tag is picked up by the federal government. It's a big investment with a big impact on the future of the city. Don Mitchell, a professor of geography at Syracuse University, is concerned that removing I-81 could unleash a flood of gentrification. Still, he says he's generally supportive of tearing down one of the city's most uninviting assets. "It's a huge psychological as well as physical barrier," Mitchell says. But for Hazel Miller, I-81 in her backyard is part of what she calls the "beautiful scenery" of flowing traffic. She would rather keep the viaduct as is. Miller is not confident that what might come next will be any better. "I don't know how wide that [proposed] boulevard is going to be, but I know [there] wouldn't be as many tractor-trailer trucks and stuff like that going over," she says. Officials say a plan of action for I-81 will not be in place until 2017. In the meantime, the elevated highway will continue to cast its long shadow. I'm Robert Siegel. And we begin this hour with the latest story in the NPR Cities Project. One thing we're exploring is the conflicted 21st-century relationship between many cities and cars. Today's exhibit: the call to tear down aging urban highways. We're joined now by Zack Seward of upstate New York's public radio reporting project the Innovation Trail. Hi, Zack. ZACK SEWARD, BYLINE: Hey, Robert. SIEGEL: And you're in Syracuse where Interstate 81 runs right through the heart of the city. Tell us what you're looking at. SEWARD: That's right I'm standing right next to this elevated section of highway. It's a 1.4-mile-long road known locally as the viaduct. And like a lot of highways built in the middle of the last century, it's kind of bumping up against the end of its lifespan. It's crumbling in parts. There's crews working on it now. Officials say it's safe, but the region is really starting to think about what comes next. You know, over the last two decades, a handful of cities around the country have removed their urban highways, with San Francisco and Milwaukee kind of being the poster children of that movement. And as transportation infrastructure ages, there's probably a place near you that's dealing with a lot of these same issues. SIEGEL: So how does the city decide what does come next for I-81, and what are the arguments for either keeping it or getting rid of it? SEWARD: Well, it's very early in the process here in Syracuse, that's for sure. Officials are seeking public input, but ultimately, it's a state project. And to boil the arguments down both for and against keeping this highway, you know, on one hand, it takes cars from one side of the city to the other, you know, very quickly, but it takes them right past housetops and treetops. And on the other hand, the structure that's carrying these cars is a barrier, a physical barrier that opponents say is an economic barrier, as well as a racial barrier. You know, either way, there's no question that I-81 has shaped this community. So to better understand that I went just a few steps away from where I'm standing now to the Pioneer Homes, a low-rise public housing project. That's where I met Hazel Miller. She moved here 40 years ago, when homes were still being ripped down to make room for the highway. HAZEL MILLER: Yes. Come in. SEWARD: Thank you very much. MILLER: ...they're going to tear down. SEWARD: You can kind of see the foundation. SEWARD: Miller lives maybe 100 hundred feet from I-81. The highway was built right through the middle of one of the state's first public housing projects, gutting this predominantly African-American neighborhood. As long as Miller has been here, the highway has driven away commerce. MILLER: Never was nothing. We don't even have a grocery store close, you know? We don't have nothing like that no more. VAN ROBINSON: All right. Now, this is a city map right here. SEWARD: Syracuse Common Council President Van Robinson unfolds a map at city hall. You can see I-81 from his office. ROBINSON: It's not a question of if it should be torn down. The question is when will it be torn down. SEWARD: Robinson says replacing the viaduct with a street-level boulevard would breathe life into the city's withered urban core. The founder of the local chapter of the NAACP has wanted to remove I-81 since he first arrived in Syracuse decades ago. Robinson has long seen the viaduct as a barrier that separates the haves from the have-nots. ROBINSON: It was a city divided. In fact, I immediately, at that time, that was years ago, called it the Berlin Wall. SEWARD: On one side of that wall is prosperous University Hill, home to the institutions that drive the Syracuse economy. On the other side is poverty and neglect. A few years back, some streets within the Pioneer Homes were gated off in response to a rash of drive-by shootings. Robinson says tearing down I-81 is a relatively simple step that could help turn the neighborhood around. ROBINSON: It's not as if it's 100 miles of, you know, roadbed we have to put down. It's 1.4 miles. EMANUEL CARTER: And let's see we can walk out along the end of the dorms there, and I think we can see 84. SEWARD: We're walking to an overlook on University Hill with a clear view of the highway below. I'm with Emanuel Carter, a professor at the state university's College of Environmental Science and Forestry. CARTER: It's really easy now to look at mistakes that were made 40 years ago and call them mistakes. SEWARD: A few years ago, Carter teamed up with a local citizens' league on a study called Rethinking I-81. The main finding was that removing the I-81 viaduct would spur significant development. CARTER: We're in full-blown sprawl mode right now, and one of the ways we can kind of refocus on the core would be to have 81 cease to be an impediment. 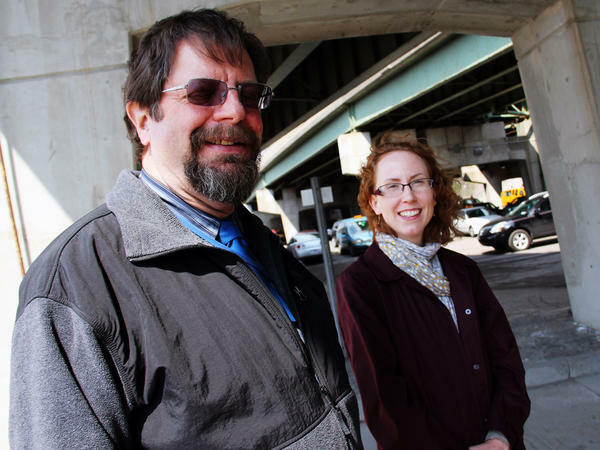 SEWARD: I'm here now under the northern end of the I-81 viaduct in downtown Syracuse. As you can hear, it's noisy. It's kind of dark, and it's pretty much at the end of its shelf life. BILL EGLOFF: You can see the patches that we've made. SEWARD: Bill Egloff is with the New York State Department of Transportation. He's in charge of keeping the highway standing. And though he admits that something needs to be done, Egloff says tearing down I-81 is no simple fix. EGLOFF: If the remaining traffic had to negotiate the city streets as they are right now, that would be a problem. SEWARD: Planning officials call Syracuse a 20-minute city. You can drive anywhere you need to quickly and easily. 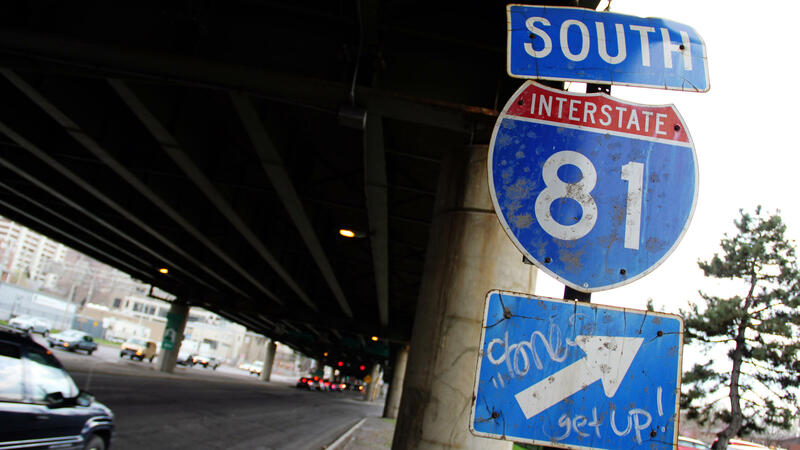 The state DOT is in the early stages of a planning process they're calling the I-81 Challenge. Planners recently gauged public opinion on three basic options: keep the viaduct and update it to current standards, tear it down and build a sunken roadway or tear it down and build a boulevard. Egloff says none of the options will be cheap. EGLOFF: Five years ago, we had our structures engineer give us a rough estimate of the whole deck replacement, and that was in the neighborhood of $350 million. SEWARD: Wow. For 1.4 miles? EGLOFF: Yeah. So it was then that we decided a project that expensive we really need to sit back and think about it. SEWARD: Planning officials say that $350 million is now closer to a half a billion. Traditionally, nearly all of that price tag is picked up by the federal government. It's a big investment with a big impact on the future of the city. DON MITCHELL: It's a huge psychological as well as physical barrier. SEWARD: Don Mitchell is a professor of geography at Syracuse University. From his office on University Hill, Mitchell is concerned that removing I-81 could unleash a flood of gentrification. Still, he says he's generally supportive of tearing down one of the city's most uninviting assets. MITCHELL: Especially in the wintertime when all that kind of brine off the road is dripping off of it, it's cold and windy and miserable. It just feels really, really big. It feels bigger than it is. MILLER: It's a beautiful scenery, you know? SEWARD: Back at Hazel Miller's house next to the highway, the traffic keeps flowing by. For her part, she'd rather keep the viaduct as is. She's not confident that what might come next will be any better. MILLER: And I don't know how wide that boulevard is going to be, but I know it wouldn't be as many tractor-trailer trucks and stuff like that going over. SEWARD: I just heard one right now when you said that. MILLER: Oh, you hear a lot of them, but you know. SEWARD: A plan of action for this stretch of I-81 won't be in place until 2017. And as in other cities, the elevated highway will continue to cast its long shadow. On Almond Street by the 1-81 viaduct, I'm Zack Seward for the NPR Cities Project. Transcript provided by NPR, Copyright NPR. The dozens of sticky notes mean the jury is still out. The tabs of paper were posted next to five options Wednesday afternoon. Each represents a different future for the stretch of Interstate 81 that runs through downtown Syracuse. 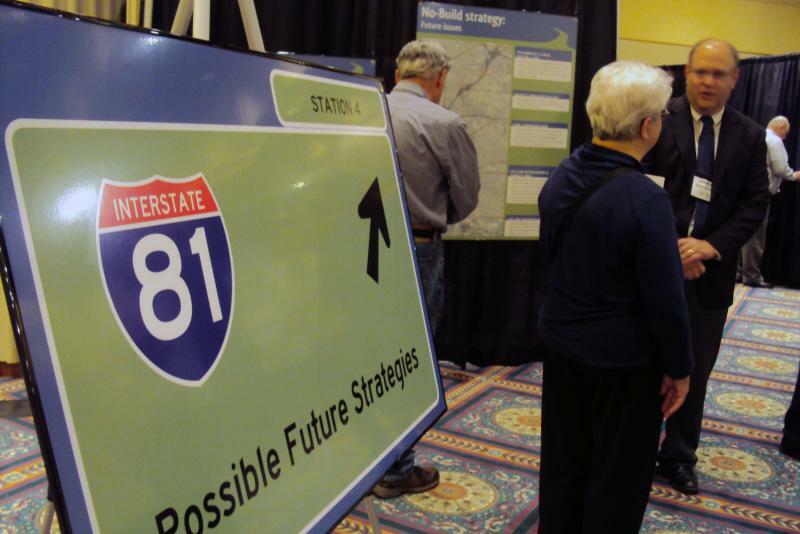 Transportation planners from the I-81 Challenge began a second round of community meetings Wednesday. The public input they gather will help decide the aging highway's fate. Five different options, with a final decision five years away. Tomorrow afternoon transportation planners from the I-81 Challenge will present a broad set of options for what to do about the aging, elevated portion of I-81 known locally as "the viaduct." After that, planning officials begin the process of collecting the public's opinion. Mid-twentieth century Syracuse was confronted with something new and modern: a plan for an elevated interstate running through the heart of the city. Now, the 'Cuse is trying to imagine what life might be like without it. "The Viaduct," as the elevated portion of Interstate-81 is known, was completed in the late '60s. It's now nearing its expiration date.